What DaVinci was talking about, though it wasn't called it at the time, was biomimicry. Biomimicry is the practice of using designs from the natural world to solve technological and engineering problems. Were he alive today, there's no doubt that Mr. DaVinci would be a big proponent of biomimicry. Nature is more fascinating the deeper you look into it. When we look deeply into nature, we're peering into a laboratory that is over 3 billion years old, where solutions to problems have been implemented, tested, and revised over the course of evolution. That's why biomimicry is so elegant: on Earth, nature has had more than 3 billion years to solve problems, the same kinds of problems we need to solve to advance in space exploration. MAVs are small, usually no bigger than 15 cm in length and 100 grams in weight. MAVs are not only small, they're quiet. Fitted with chemical sniffers, cameras, or other equipment, they could be used to explore confined spaces too small for a human to access, or to stealthily explore areas of any size. Terrestrial uses could include hostage situations, assessing industrial accidents like Fukushima, or military uses. But it's their potential use on other worlds yet to be explored that are the most fascinating. MAVs have appeared in science fiction books and movies over the years. Think of the hunter-seekers in Dune, or the probes in Prometheus that were used to map the chamber ahead of the humans. Those designs are more advanced than anything currently being worked on, but flapping-wing MAVs are being researched and designed right now, and are the precursors to more advanced designs in the future. High-speed cameras have spurred on the development of flapping-wing MAVs. The detailed images from high-speed cameras have allowed researchers to study bird and insect flight in great detail. And as it turns out, flapping-wing flight is much more complicated than initially thought. But it's also much more versatile and resilient. That explains its persistence in nature, and its versatility in MAV design. Here's some video from a high-speed camera capturing bees in flight. The DelFly Explorer from the Delft University of Technology is one intriguing design of flapping-wing MAV. Its small and lightweight stereo vision system allows it to avoid obstacles and maintain its altitude on its own. Flapping-wing MAVs don't require a runway. They also have the advantage of being able to perch on small spaces to conserve energy. And they have the potential to be very quiet. This video shows a flapping-wing vehicle being developed by Airvironment. Flapping-wing MAVs are highly manoeuvrable. Because they generate their lift from wing movement, rather than forward motion, they can travel very slowly, and even hover. They can even recover from collisions with obstacles in ways that fixed wing or rotary wing MAVs can't. When a fixed wing vehicle collides with something, it loses its airspeed and its lift. When a rotary wing vehicle collides with something, it loses its rotor speed and its lift. Because of their small size, flapping-wing MAVs are likely to be cheap to produce. They'll never be able to carry the payload that a larger vehicle can, but they'll have their role in exploration of other worlds. Robotic probes have done all of the exploring for us on other worlds, at a much cheaper cost than sending people. While-flapping wing MAVs are presently being designed with terrestrial performance in mind, it's an easy enough leap from that to designs for other worlds and other conditions. Imagine a small fleet of flapping-wing vehicles, designed for a thinner atmosphere and weaker gravity, released to map caves or other hard to reach areas, to locate water or minerals, or to map other features. Ants seem mindless when you look at them individually. But they do amazing things together. Not only do they build intricate and efficient colonies, they also use their bodies to build floating bridges, and bridges suspended in mid-air. This behaviour is called self-assembly. Ant colonies and ant behaviour have a lot to teach us. There's a whole field of research called Ant Colony Optimization that has implications for circuits and systems, communications, computational intelligence, control systems, and industrial electronics. 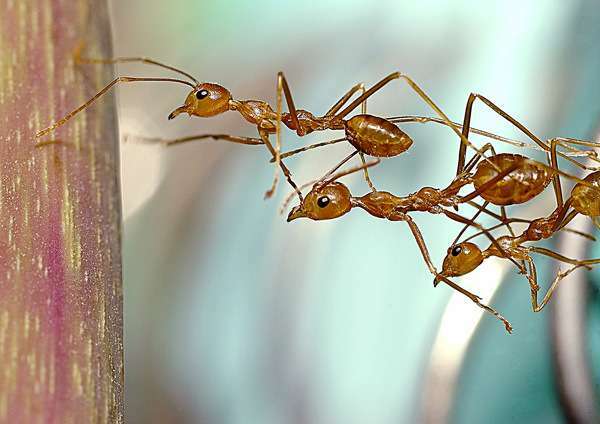 Here's a video of Weaver ants building a bridge to span the gap between two suspended sticks. It takes them a while to get it. See if you can watch without cheering them on. Ant colonies are one example of what are called collective systems. Other examples of collective systems in nature are bee and wasp hives, termite mounds, and even schools of fish. The robots in the next video have been designed to mimic natural collective systems. These robots can do very little alone, and are prone to error, but when they work together, they're capable of self-assembling into complex shapes. Self-assembling systems can be more adaptable to changing conditions. When it comes to exploring other worlds, robots that can self-assemble will be able to respond to unexpected changes in their surroundings and in environments of other worlds. It seems certain that self-assembly by collective systems will allow our future robotic explorers to traverse environments and survive situations that we can't specifically design them for in advance. These robots will not only have artificial intelligence to think their way through problems, but will also be able to self-assemble themselves in different ways to overcome obstacles. Exploring Mars with robotic rovers is an astonishing achievement. I had chills running down my spine when Curiosity landed on Mars. But our current rovers appear brittle and frail, and watching them move slowly and clumsily around the surface of Mars makes you wonder how much better they could be in the future. By using biomimicry to model robotic rovers on animals, we should be able to build much better rovers than we currently have. Wheels are one of humanity's earliest and greatest technologies. But do we even need wheels on Mars? Wheels get stuck, can't traverse abrupt changes in height, and have other problems. There are no wheels in nature. Snakes have their own unique solution to the problem of locomotion. Their ability to move over land, up and over obstacles, squeeze through tight places, and even swim, makes them very efficient predators. And I've never seen a snake with a broken let, or a busted axle. Could future rovers be modelled on terrestrial snakes? This robot moves across the floor the same way snakes do. Here's another robot based on snakes, with the added capability of being at home in the water. This one looks like it's enjoying itself. This robot is not only based on snakes, but also inchworms and insects. It even has elements of self-assembly. Wheels would only hold it back. Some segments could certainly hold sensors, and it could even retrieve samples for analysis. Watch as it reassembles itself to overcome obstacles. It's easy enough to think of multiple uses of snake bots. Imagine a larger platform, similar to the MSL Curiosity. Now imagine if its legs were actually several independent snake bots that could detach themselves, perform tasks like exploring difficult to access areas and retrieving sample, then returning to the larger platform. They would then deposit samples, download data, and re-attach themselves. Then the whole vehicle could move to a different location, with the snake bots carrying the platform. If this sounds like science fiction, so what? We love science fiction. The flow of energy from the sun is diluted to a trickle the further afield in the solar system we go. 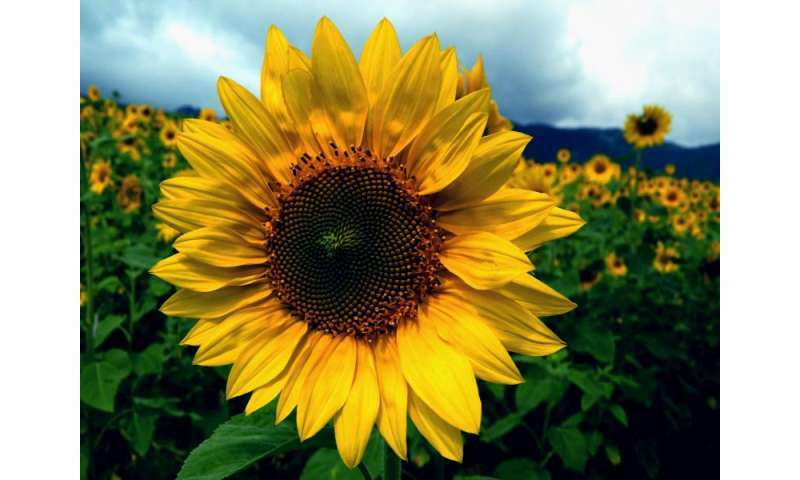 While we keep getting more and more efficient at collecting the sun's energy, biomimicry offers the promise of a 20% reduction in solar panel space required, just by mimicking the sunflower. Concentrated Solar Plants (CSPs) are made up of an array of mirrors, called heliostats, that track the sun as the Earth rotates. The heliostats are arranged in concentric circles, and they catch the sunlight and reflect it towards a central tower, where the heat is converted into electricity. When researchers at MIT studied CSPs in more detail, they discovered that each of the heliostats spent part of the time shaded, making them less effective. As they worked with computer models to solve the problem, they noticed that possible solutions were similar to spiral patterns found in nature. From there, they looked at the sunflower for inspiration. The sunflower isn't a single flower. It's a collection of small flowers called florets, much like the individual mirrors in a CSP. These florets are arranged in a spiral pattern with each floret oriented at 137 degrees to each other. This is called the 'golden angle', and when the florets are arranged like this, they form an array of interconnected spirals that conforms to the Fibonacci sequence. MIT researchers say that organizing individual mirrors the same way in a CSP will reduce the space needed by 20%. Since we're still putting everything we need for space exploration into space by blasting it out of Earth's gravity well strapped to enormous, expensive rockets, a 20% reduction in space for the same amount of solar energy collected is a significant improvement. Extremophiles are organisms adapted to thrive in extreme environmental conditions. As of 2013, there have been 865 extremophilic microorganisms identified. Their recognition has given new hope to finding life in extreme environments on other worlds. But more than that, mimicking extremophiles may help us explore these environments. Strictly speaking, Tardigrades are not exactly extremophiles, because though they can survive extremes, they are not adapted to thrive in them. However, their ability to withstand environmental extremes means they have a lot to teach us. There are about 1,150 species of Tardigrades, and they have the ability to survive in conditions that would kill human beings, and would quickly degrade the functioning of any robotic probes that we may send to extreme environments. Tardigrades are actually tiny, aquatic, eight-legged micro-animals. They can withstand temperatures from just above absolute zero to well over the boiling point of water. They can survive pressures about six times greater than the pressure at the bottom of the deepest ocean trenches on Earth. Tardigrades can also go ten years without food or water, and can dry out to less than 3% water. They're basically the super-tiny super heroes of the Earth. But as far as space exploration goes, it's their ability to withstand ionizing radiation thousands of times higher than humans can withstand, that interests us the most. Tardigrades are called nature's toughest creatures, and it's easy to see why. It's probably in the realm of science fiction to imagine a future where humans are genetically engineered with tardigrade genes to withstand radiation on other worlds. But if we survive long enough, there's no doubt in my mind we will borrow genes from other terrestrial life to help us expand into other worlds. It's only logical. But that's a long way off, and tardigrade survival mechanisms may come into play much sooner. Worlds like Earth are lucky to be shrouded by a magnetosphere, which protects the biosphere from radiation. But many worlds, and all the moons of the other planets in our solar system—other than Ganymede—lack a magnetosphere. Mars itself is completely unprotected. The presence of radiation in space, and on worlds with no protective magnetosphere, not only kills living things, but can affect electronic devices by degrading their performance, shortening their lifespan, or causing complete failure. Some of the instruments on the Juno probe, which is on its way to Jupiter right now, are not expected to survive for the duration of the mission because of the extreme radiation around the giant gas planet. Solar panels themselves, which must be exposed to the sun in order to function, are particularly susceptible to ionizing radiation, which erodes their performance over time. Protecting electronics from ionizing radiation is an essential part of spacecraft and probe design. Typically, the sensitive electronics in spacecraft and probes are shielded by aluminum, copper, or other materials. The Juno probe uses an innovative titanium vault to protect its most sensitive electronics. This adds bulk and weight to the probe, and still won't provide complete protection. The Tardigrades have some other way of shielding themselves which is probably more elegant than this. It's too soon to say exactly how tardigrades do it, but if pigmentation shielding has something to do with it, and we can figure it out, mimicking Tardigrades will change the way we design spacecraft and probes, and extend their lifespans in extreme radiation environments. So how about it? Will our future exploration missions involve snake bots that can self-assemble into long chains to explore hard to reach areas? Will we unleash swarms of flapping-wing MAVs that work together to create detailed maps or surveys? Will our probes be able to explore extreme environments for much longer periods of time, thanks to Tardigrade-like protection from radiation? Will our first bases on the moon or other worlds be powered by sunflower-inspired Concentrated Solar Plants? If Leonardo DaVinci was as smart as I think he was, then the answer to all those questions is yes.